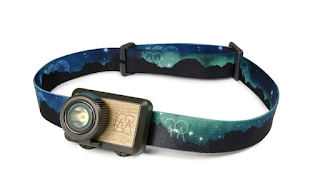 If you’re not hiking, cycling or Nordic skiing at night, you might think you have no need for a headlamp. But, I often bring along one on my trips that don’t doing involve any of these or other adventurous activities. Whether I’m staying at a rural accommodation or an urban inn, a headlamp comes in handy. Just a few weeks ago, I was staying in Guildford, Connecticut that’s hardly a wilderness retreat. Yet, my inn was a 10-minute walk from the town green, a 10-minute almost completely dark walk at night where the street lamps were mostly nonexistent. I carried my UCO Hundred, a small headlamp that measures barely 2” x 2” x 2” and weighs in at two ounces. The light is ultra bright and has three settings with the high beam producing 100 lumens that was bright enough to light up the sidewalk almost 200 feet ahead of me. This lamp not only allowed me to avoid any sidewalk obstacles but it also made me visible to drivers who crossed my path at intersections.